I am looking for sample code that uses sqlite fie (for example, LasVegas3857.sqlite as in WorldMapKitSDKEval.zip) as map source. but it did now show anything for 5 minutes or longer. We are considering to use SQLite for our offline tablet so speed for rendering is important. It looks impossible to render anything long than 5 mins. Please upload your sample which is using LasVegas3857.sqlite as data, you don't need to upload the data, so we can try to reproduce it. I looked at the links you provided. They don't seem to provide code samples to render map from SQLite map files. Here is an update. It turns out the code snippets do render a few polygons. The reason it didn't work was due to a bug in my code for zoom level. Is there a recommended set of features (tables in SQLite file) together with styles to add to the map? Is there a way to display street names or names of POIs? As we are discussing to buy World Street maps, we need a way to display the amp and check its performance. Here we have a sample about how to render a table in Sqlite, the data source is LasVegas3857.sqlite. If your data contains the information for example street name, it can render it. If your data contains point data for POI, it can be rendered by set DefaultPointStyle for layer. Please modify the data path for make it works. Thank you for the sample code. It works for me. But after I added another SqliteFeatureLayer for "osm_road_streets_linestring", loading and zooming takes considerable longer time. Is there a way to make loading and zooming more smooth? I attached a screen shot of it. What's the minimum set of SqliteFeatureLayers for the offline map do we need to have same amount of info (look and feel) as the online map? What are the recommended styles for the SqliteFeatureLayers? I was able to set MapUnit as GeographyUnit.DecimalDegree through Project4Porjection. It seems to me that theroadblocks are that time to load and time to zoom are too long. It takes 10+ seconds to load map initially and 5+ to zoom in/out for LasVegas3857.sqlite. The two SqliteFeatureLayer's I added are "osm_water_polygon" and ""osm_road_streets_linestring". To achieve the result of worldMap as attached screenshot, I am afraid more layers are needed, thus longer time. And I remembered the data we used is about 160GB, but you can remove unnecessary data from it follow your requirement to reduce the data size. LasVegas3857.sqlite in WorldMapKitSDKEval.zip contains osm_road_streets_linestring table. The file size is 49MB. To render one single table might be fast, but it becomes much slower to render more than two tables, let alone all of them. WorldMapKitSDKEval.zip (about 18MB) is available from ThinkGeo Product Center 9.0, Map Suite World Map Kit SDK 9.0, "Download Sample Database". I will try generate LasVegas4326 and test it. Have you got chance to download and try LasVegas3857.sqlite from WorldMapKitSDKEval.zip? I have two follow up questions. For table osm_road_streets_linestring, column highway can have values of "service", "residential", "motoway", "tertiary", etc. Is there a way to render only highway of value "motoway" from zoom level 1 to level 10; "motorway", "road" from level 11 to level 15; "motoway", "road", "residential" and others from level 16 to level 20? Or have different styles based on values of highway? My second question is about WorldMapKitDataExtractor. I am trying to generate a dbase in 4326 as in the attached screen shot. But the output DB has only 24KB in size. It only contains one table "ne_country10m_linestring". Am I doing something wrong? Thanks to let us know where you get the data. Some data contains lots of records, if you render them in high zoomlevel, it need to load all data and it should take much source. And it don't have a result I think that should because your bouding box is not correct, source data should only contains the data in Las Vegas. If you need 4326 data, one solution is you write custom code to build it, the other solution is contact our sales to check whether they have a 4326 version for download. WorldStreetsLayer.cs is a good source for rendering map data. Thank you. The samples I can find from Thinkgeo website that use WorldStreetsLayerSDK to render map are WinForm apps. Can you point me to a WPF sample which uses WorldStreetsLayerSDK? 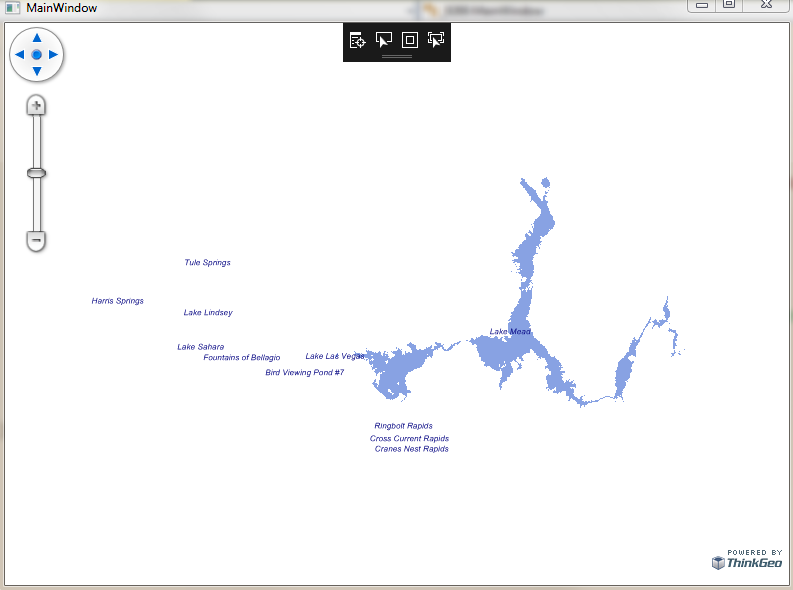 The extractor is a WPF app but it does not render map.